LigerBots Blog - 3D Printed Design Contest - Submission Date Extended! 3D Printed Design Contest – Submission Date Extended! UPDATE: We extended the date to submit to the LigerBots annual 3D Printed Design contest to allow teams who are returning from Houston or headed to Detroit time to submit. The new date is May 1, 2018. We want to see your creative use of 3D printing on your robot or for another team purpose. Individuals and FIRST robotics teams can submit 3D printed parts to share their innovative solutions to design challenges. 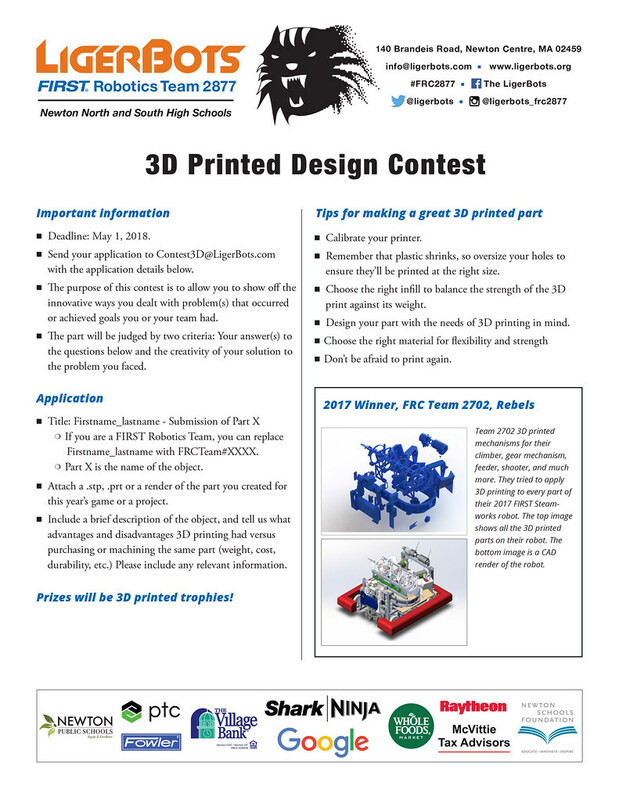 Please send submissions to [email protected] For more details, please see the 2018 3D printed part submission rules in the flyer below. You can read about the 2017 winners here and the 2016 winners here. We love seeing the creative ways that teams use 3D printing. « LigerBots Headed to FRC World Champs!